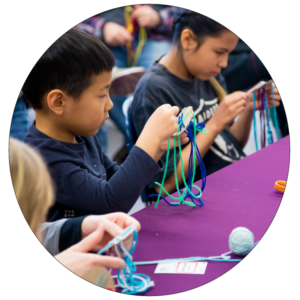 Give your students an immersive fiber art experience with a Textile Center field trip! With a teaching artist as your guide, tour our gallery spaces and take part in interactive activities that help you learn more about the art. Students will then create a hands-on project to take home. We are happy to work with you to customize your tour and project to match a curriculum goal or help you earn a “badge” for your group. Costs vary based on the size of the group and activities selected. Please fill out the form below to apply. It’s amazing what colorful loose wool, warm water, and soapy suds can create! 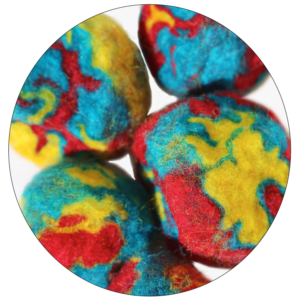 Learn how to wet felt balls and turn them into mesmerizing wool geodes. String them together and add a keychain to decorate your backpack. 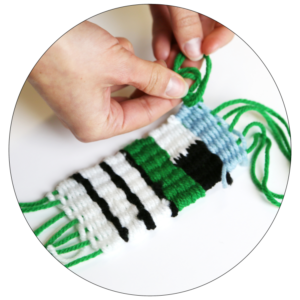 Create a bookmark or bracelet while you learn the basics of weaving! Use a variety of colorful fibers and thread to make a one-of-a-kind woven creation for you, a friend, or family member. 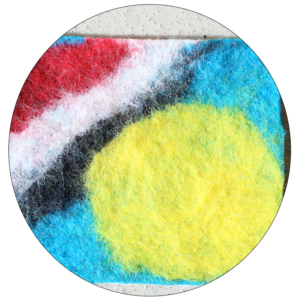 Wet felting, thought to be the oldest textile technique, is the process of turning fluffy wool roving into felt fabric. Craft a design with your favorite colors and create a vibrant square of fabric perfect as a coaster or a patch! He’s alive! Design and create your own monster stuffed animal. 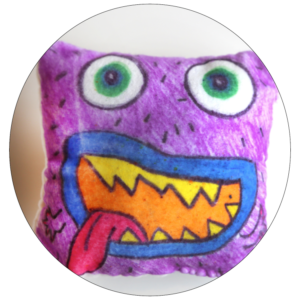 Draw using dye transfer crayons and transform your drawing into 3D by sewing and stuffing your own one-of-a-kind creature! Kumihimo—braided cord—is a Japanese technique of braiding multiple threads. The braids were once used to lace samauri warrior’s armor, over 1,000 years ago! Now Kumihimo is used as an art form that can decorate just about anything. Indigo, originating from Japan, is a plant that creates a blue dye. When cloth is pulled from the dye vat it turns from yellow to blue as it oxidizes, making it also known as the magic dye. 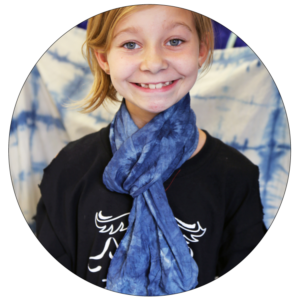 Students will learn shibori, a folding technique that creates mesmerizing patterns when dye is applied. Please click one. A mileage fee will be added to field trips that do not take place at Textile Center. Field trips run from 1.5 - 2 hours long.